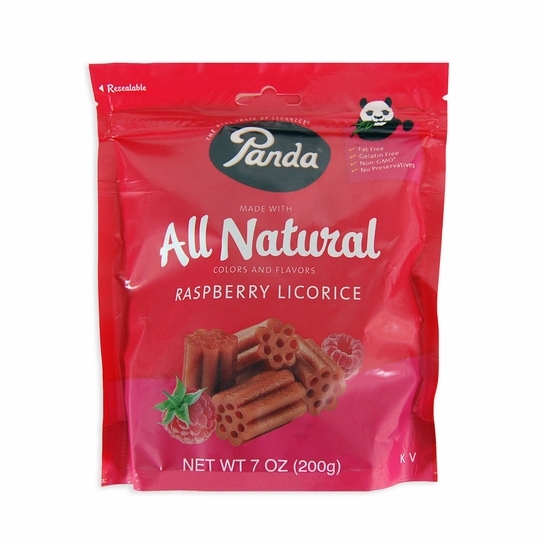 More about Panda Raspberry Licorice Bag - 7 oz Panda Raspberry Licorice is made with real delicious raspberries for a mouth watering raspberry taste sensation. Panda has been producing the world's leading premium quality, soft licorice since 1927. Panda Licorice is made from all natural ingredients and cooked in such a traditional way by drawing inspiration from the clean Finnish nature, it's easy to see why everyone around the world truly loves their licorice. Ingredients: Molasses, wheat flour, raspberry puree, citric acid, natural flavor, black carrot juice, licorice extract. Panda's Raspberry Licorice is a cut above other raspberry "licorice" products. In addition to the all-natural raspberry listed in the ingredients, it also contains genuine licorice. The licorice perfectly counterbalances the sweet raspberry flavor. As a result, the candy is not over-sweet and is something an adult with a sweet tooth can enjoy.